Fine craftsmanship meets aerating design in these handmade crystal glasses. What could make a "special occasion" Pinot and life-changing tapas even better? 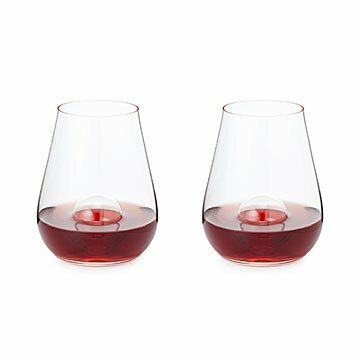 These stemless, lead-free crystal glasses, mouth-blown by German artisans, will elevate any evening. They feature a sphere integrated into the bowl for an elegant design that helps aerate your wine to enhance the sipping experience. Infused with precise hand craftsmanship, this sophisticated glassware makes a beautiful addition to your table or distinctive gift for weddings and wine lovers. Set of two glasses. Handmade in Zwiesel, Germany. Pair your Crystal Aerating Stemless Wine Glass Set with our Crystal Aerating Wine Glass Set.